Has your horse’s behavior changed? Are his eating habits different? Does he seem mildly colicky after meals? Gastric ulcers could be the culprit. As many as 80% of active sport horses might have gastric ulcers at one time or another, says Dr. Nathan Slovis, a board-certified internal medicine veterinarian and the director of the McGee Medical Center at Hagyard Equine Medical Institute in Lexington, Kentucky. 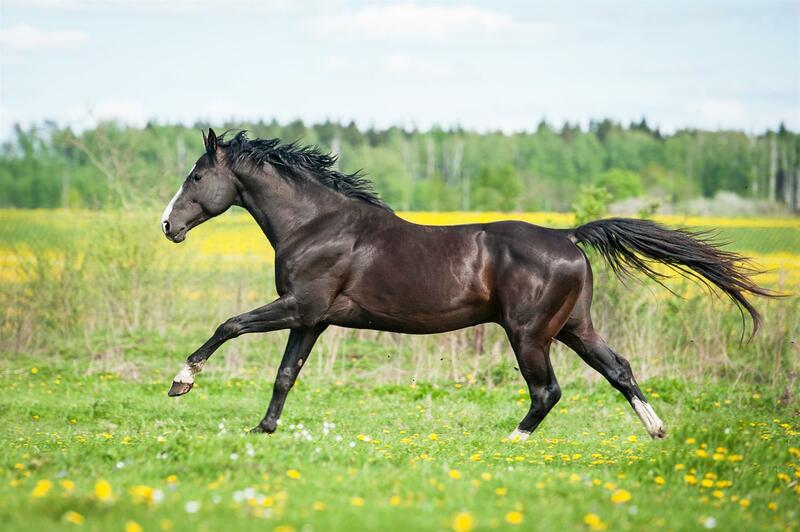 He has a strong interest in gastrointestinal disorders in the horse and is currently doing research on alternative natural therapies to promote a healthy digestive system, including this recent practical study. How serious are ulcers? Their effects can range from mild discomfort to serious intestinal impaction. Severe ulcers also can also result in bleeding and on rare occasions gastric perforations, as they can in humans. A gastroscope can definitively diagnose gastric ulcers. While many owners who suspect their horses have gastric ulcers forego a gastroscope and simply treat the symptoms, Slovis notes that, if they’re wrong about the horse having ulcers, a stomach scope is cheaper than repeatedly dosing the horse with medicine that isn’t actually tackling the problem. Needless to say, it’s best to do what you can to avoid the problem of ulcers in the first place. Regular turnout on grass can help, but busy competition horses might not have the luxury of regular pasture access. There are still steps you can take to help prevent ulcers, says Slovis. 1. Avoid twice-a-day bulk feeding. “It’s a common thing: you give them grain and hay in the morning and more grain and hay at night,” Slovis said. “Instead, try to give small amounts of food more often. If you have a sport horse who spends a lot of time in his stall at a show, maybe feed him a little in the morning, a little at lunchtime, a little in the early afternoon, and again in the evening. Spread out the concentrates; don’t just give one or two feedings. And do the same thing with hay; they can nibble that 24 hours a day. If your horse is a pig and eats all his hay at once, you can buy a special hay net with smaller holes.” The idea, Slovis says, is to spread out your horse’s food intake to make it as natural as possible. 2. Be careful about your grains. Giving your horse excessive amounts of cereal grains in one feeding, instead of spreading them out in small quantities, can be harsh on a horse’s stomach, Slovis cautions. Hand-walking or hand-grazing can help a horse relax, especially if he is spending more time than usual in his stall while at a show. Another trick to keep a horse relaxed and happy in his stall: get him a toy. Relaxation and stress-reduction are important, because anxiety can contribute to gastric ulcers in horses, just as they do in humans. Younger horses can be somewhat more susceptible to developing ulcers, especially during the breaking and training period, Slovis says. But older horses—particularly ones that travel a lot, are confined for longer periods, or whose diets are more inconsistent—can also be at increased risk for gastric ulcers, as can horses undergoing treatment with non-steroidal anti-inflammatories like bute and banamine. Empty stomachs also can cause problems: if a horse has to fast or is ill and doesn’t want to eat, he can develop ulcers in the stomach after 24 to 48 hours without eating. “Any kind of situation that can involve stress, like trailering or stabling away from home, can contribute to them,” explained Slovis, who has a strong interest in gastrointestinal disorders in the horse and is currently doing research on alternative natural therapies to aid in the healing of equine gastric ulcers. Dosing with an omeprazole product like GastroGard® before shipping long distances can help, Slovis said. Omeprazole also is the standard treatment for ulcers. If you’re treating a horse with GastroGard, Slovis recommends giving it to the horse on an empty stomach. “Research has shown in animals that if you give GastroGard on a full stomach, you might not get the increase in pH that you want because the stomach doesn’t absorb it as well on a full stomach,” he said. When considering treatments it’s always important to consult your veterinarian, who also might recommend and prescribe alternatives or combinations of treatments. If your horse has ulcers, look for improvement after a week of daily treatment, Slovis advises. “At least a small improvement should occur within a week,” he said. And remember: horses who have had ulcers once can be predisposed to getting them again—so always keep a close eye on your horse for signs of behavioral or eating changes that might signal their return. Time off and pasture turnout also can help, Slovis said. “Anxiety can be a big factor in this, and sometimes just giving the horse time off can help them get straightened out,” he said. As always, seek your veterinarian’s advice if you suspect your horse might have ulcers or if you’re looking for strategies to help your horse avoid them. For more information about gastric ulcers and their treatment, visit Hagyard.com and HagyardPharmacy.com. This entry was posted in Horse Health on July 27, 2017 by ludlumfarms.